Can I tell you how excited I was to start The Son of Neptune by Rick Riordan?? SO EXCITED! 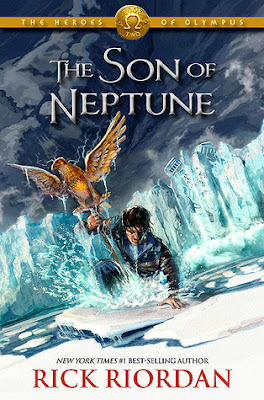 I did not expect to enjoy The Heroes of Olympus series as much as I am, but after reading The Lost Hero last month, I couldn’t wait to get started on The Son of Neptune. I did not at all think it would be possible to enjoy this series just as much as the Percy Jackson series, but I am, and I can’t wait to continue along. As I mentioned above, I didn’t expect to enjoy this book more than I did The Lost Hero, but I did. Probably because the first book was missing the one character that I love the most in the series, and we finally get to see him here, along with an all new cast as well. (Which is another thing I love about this spin-off series; we get to meet a lot of interesting new characters, but some of our faves are still around as well.) There were a lot of great characters in the story, but I really love both Hazel and Frank, who were both completely fascinating and totally adorable as well. I’m super curious to see what’s going to happen next for this group of Heroes. The storyline for the book follows the same line as The Lost Hero, though while the previous book was set in around the familiar Camp Half-Blood, in this book it was set around Camp Jupiter, which is the camp for Roman demi-gods. You’d think this would get confusing, but it really doesn’t, although I do have to stop myself once in a while to remember the Roman names of the Greek Gods, but that’s just me. I’m really enjoying the storyline for this series, and I can’t wait to read the next three books in it to see where exactly this story is going! Overall; As you can probably tell, I really enjoyed The Son of Neptune! It was a great sequel to The Lost Hero, and I am now super excited to be starting The Mark of Athena, which is the third book in the series. Also, I am SO glad that this whole series has already been published, as I think I would go a little insane if I had to wait a year or more to see what’s going to happen next. *grin*. If you enjoyed the Percy Jackson series, you definitely need to check out The Heroes of Olympus!! I cannot believe I have not read a single Rick Riordan book. Can I even call myself a bookworm? The thing is: I know I`ll love the books and I`m afraid I will get so fascinated with this fandom, I won`t pick anything else for a while.